What is Secure Delivery Center? 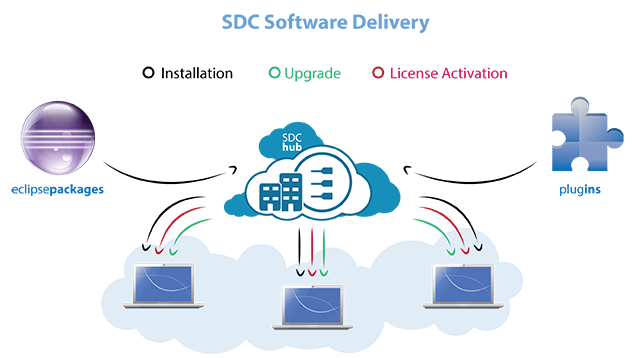 Genuitec’s Secure Delivery Center (SDC) is a software distribution manager that assists administrators in providing software to various groups in their organization with little to no intervention by end users. In the typical software lifecycle, you acquire software and its license key, install the software, and provide the license key to access the software. You then need to deliver this software to multiple users in your organization. Managing licenses, updates, rollouts, and standardization can be a time-consuming and costly process. Having a system that helps you manage software delivery, updates, and license renewals can save time that otherwise can be spent on more productive tasks. 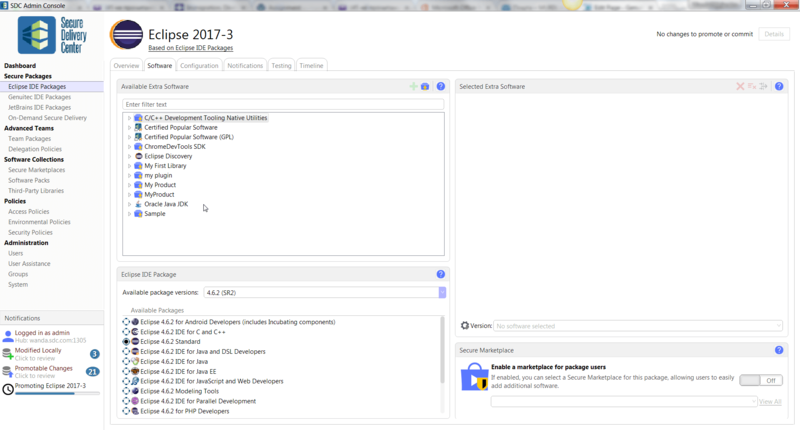 With SDC’s Admin Console, you have a centralized location for managing both the distribution and user access of Eclipse-based IDEs, RCP software, or add-on software marketplace catalogs. For IDE management, you can choose to have software available on a web portal for download, or you can use the installer generated by SDC with an SMS system to silently push installations, including activation, to your users. For those wanting to add pre-defined Marketplace catalogs and/or security to existing Eclipse installations, administrators can use SDC to deliver private software catalogs to Eclipse users, and control security policies and add-on software in a secure manner. Using this system, administrators have absolute control over versions and release rollout without requiring developers to stop what they are doing to work on updating their development environment. 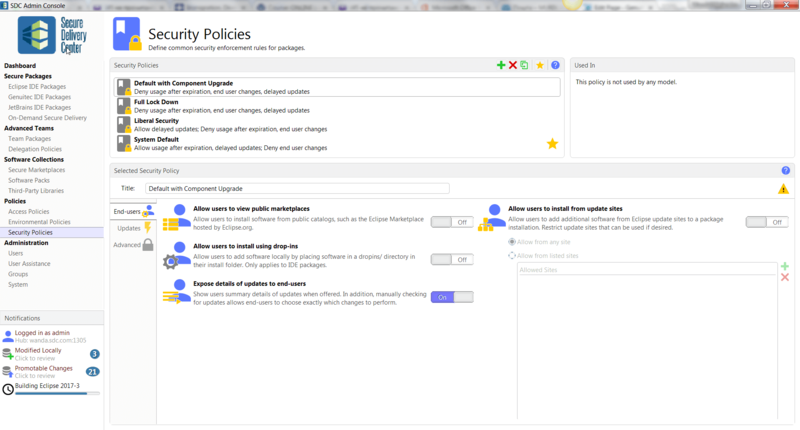 Admins create various packages depending on the needs of the user groups in your enterprise. Packages are used to deliver complete, custom IDEs, RCP software, or secure, private marketplace catalogs to existing Eclipse installations. 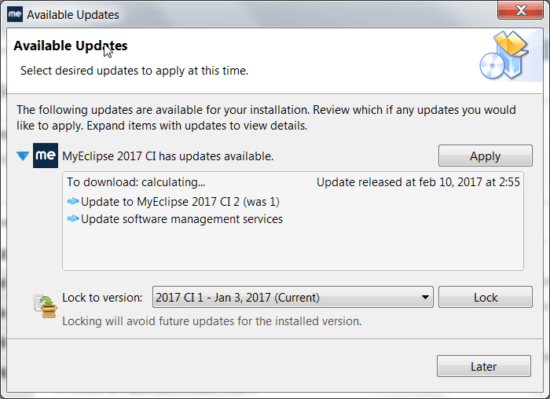 Packages can vary by who is allowed access, how updates and software are accessed, add-ons that are included, workstation preferences, etc. You can have as many packages as required to meet the needs of the different teams in your organization. By providing the exact tool stack required by a team, on-ramping engineers to projects is quick and easy. Keeping team members on the same tools through the duration of a project decreases chances of build issues due to untested software or add-on versions. 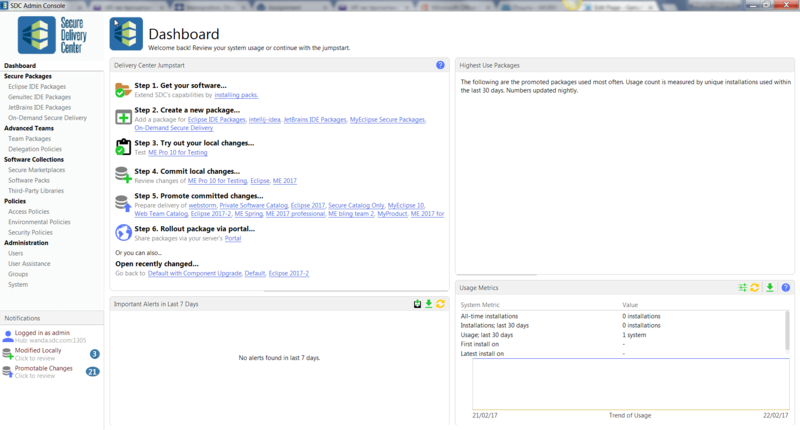 If team tool updates are needed, the required changes are rolled out via the SDC hub. Teams simply accept the update and continue working. To maintain integrity of team tool stacks, all required tools can be packaged and provided to teams. You can control the level of security, allowing some teams to have access to public marketplaces or add-on sites, or completely locking down access to additional add-ons and tool updates. Another option allows access to approved tools via a private catalog, which resides safely behind your firewall. License activation, maintenance and notification are managed by SDC, simplifying the administration task of keeping everyone in compliance. Licenses are maintained in SDC as a pool, so you are not required to keep up with which license goes with which desktop. You need only provide your license information to the system – SDC does the rest. As licenses expire, you simply add new ones to the pool.